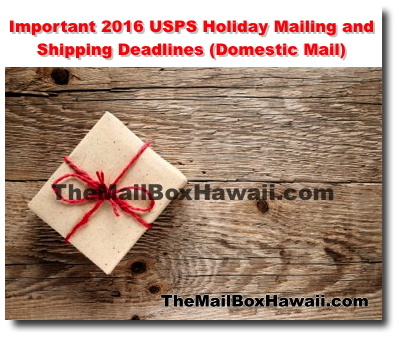 To ensure that your mail and packages arrive on time this holiday season, here are the 2016 mail shipping deadlines from the United States Postal Service (USPS). Dec. 15 - Standard Post - USPS Retail Ground service for less-than-urgent deliveries and oversized packages. Dec. 20 - First Class Mail - Service for standard-sized, single-piece envelopes and small packages weighing up to 13 ounces with delivery in 3 business days or less. Dec. 21 - Priority Mail - Domestic service in 1, 2, or 3 business days based on where your package starts and where it's being sent, variety of Flat Rate options. Dec. 23 - Priority Mail Express - Fastest domestic service, guaranteed overnight scheduled delivery to most locations. Some restrictions and exceptions apply. Please note, Priority Mail Express postage refund eligibility is adjusted for shipments mailed Dec. 22 through Dec. 25.